And by request, a step-by-step guide to packing your precious wine bottles for the long trek home in your checked luggage! These tips also work for other sorts of liquids in glass bottles (e.g., spirits, sodas, mineral water, etc.). 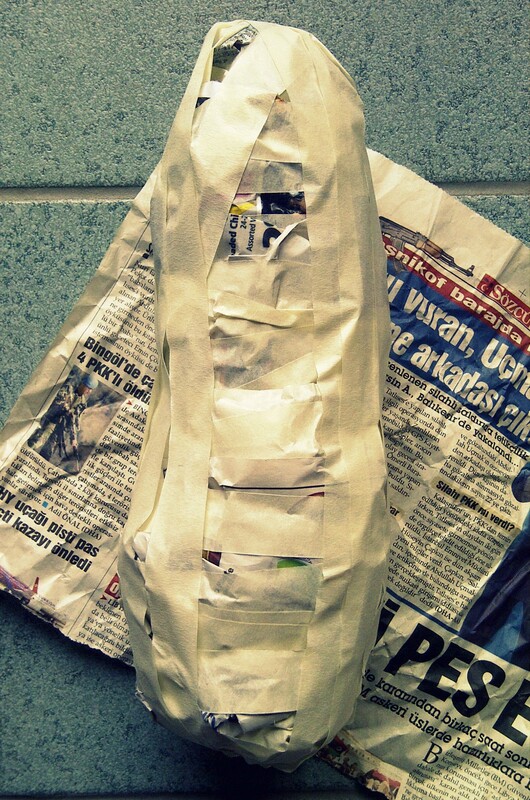 Of course there are professional methods of packing a bottle, but we travelers take what we can get. And that usually means junk and dirty clothes. 2. 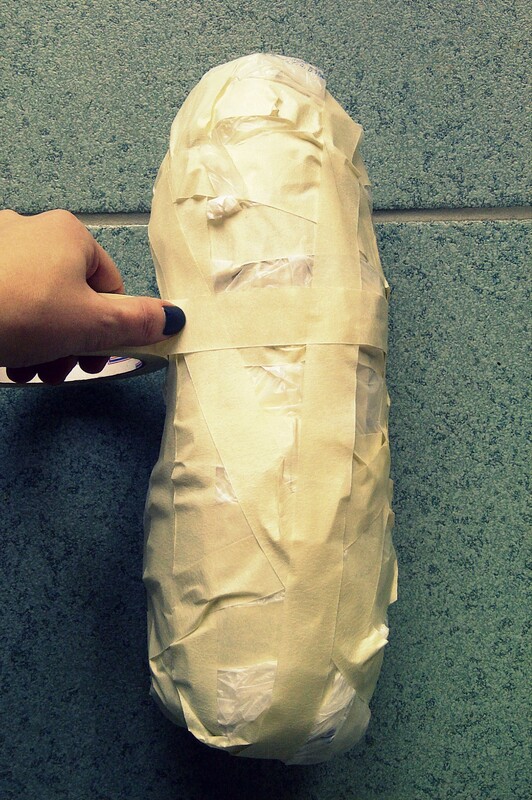 Place your wine bottle into one of the plastic bags and wrap extensively with tape. This layer is the best protection for the other items in your bag in case there does happen to be a crack in the bottle. Better to throw away a wet plastic bag than your whole suitcase of ruined clothes! 3. 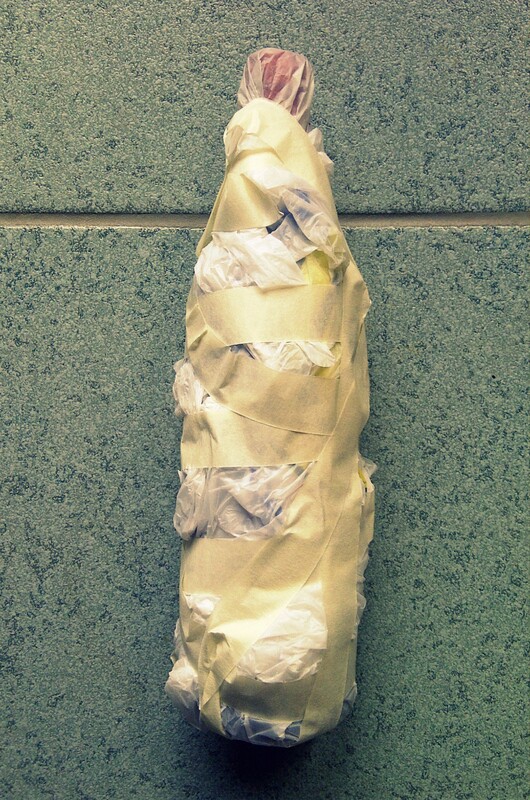 Wrap and tape a thick layer of paper around the neck and mouth of the bottle. This gives a little extra cushioning to the narrowest and most delicate part. 4. 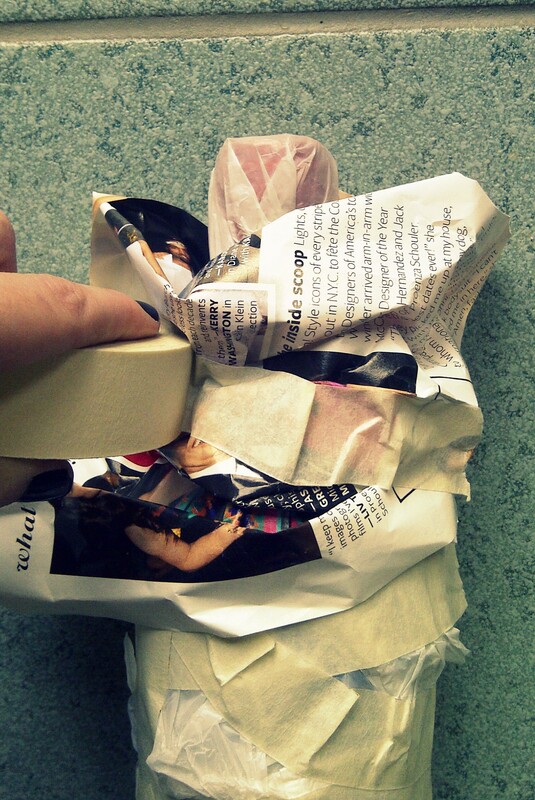 Liberally wrap and tape the paper all the way from the mouth to the punt (that conic indentation in the bottom!). Go ahead and overdo it. Tape it horizontally and vertically. The layers should feel very thick and spongy and will begin to resemble a very bizarre potato/baseball bat. 5. Put the entire contraption in another plastic bag and tape your heart out. At this point I begin to feel like a tape maniac… taping faster and faster, eyes bulging, palms sweating. It’s quite a scene. 6. 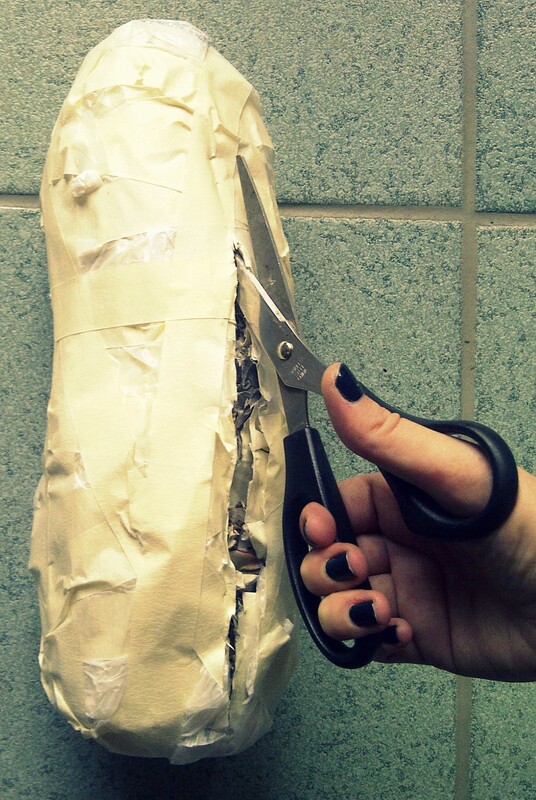 Lovingly wrap your bottle in an item of clothing. Make it a dark piece in case, heaven forbid, your suitcase goes through a tornado and there is some staining. 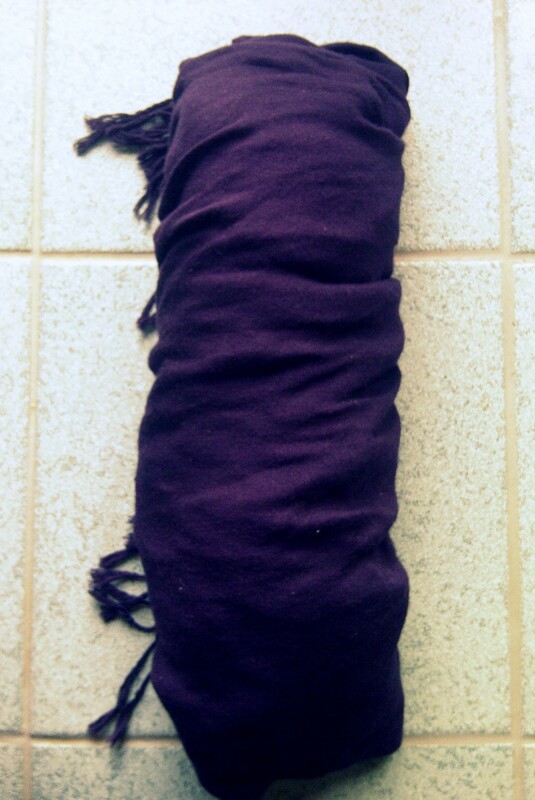 I prefer scarves because they are easy to wrap around an item a few times while not getting too bulky. 7. In keeping with the theme of cushiony layers, place your baby into another item of (dirty) clothing like a sweatshirt or pair of jeans. 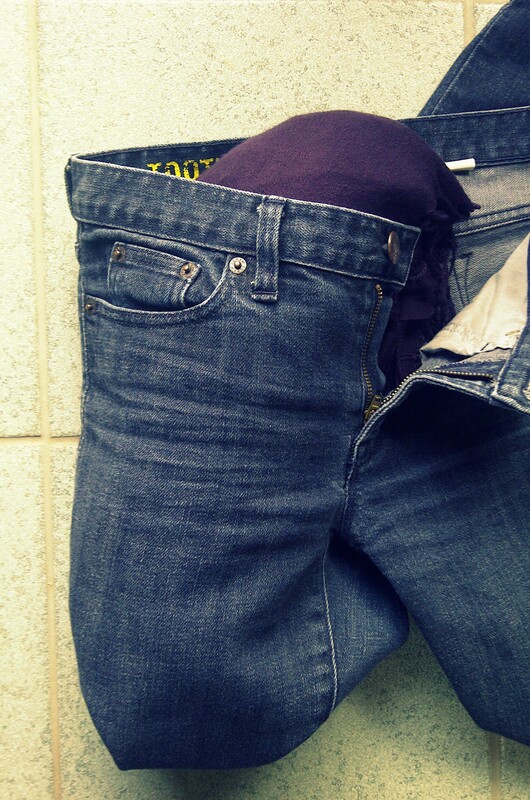 7. dirty jeans. I’m fine with it. 8. Pack the bottle into your checked luggage with your other clothes. Put it somewhere in the middle of the suitcase in a horizontal position so the bottle will then be standing vertically and upright when the suitcase is stood on its wheels. Don’t put any heavy objects to the side of the bottle that will then be “on top” when the suitcase is stood up. Make sure you surround the bottle on the left, right, bottom, and top with clothes. Your suitcase will surely be thrown around so provide as much padding as you can! 8. are we there yet? 9. When you finally get home and, crossing your fingers, open your suitcase, you can easily cut away the layers with a pair of scissors. 9. feels like Christmas morn. A mélange of suitcase paraphernalia. 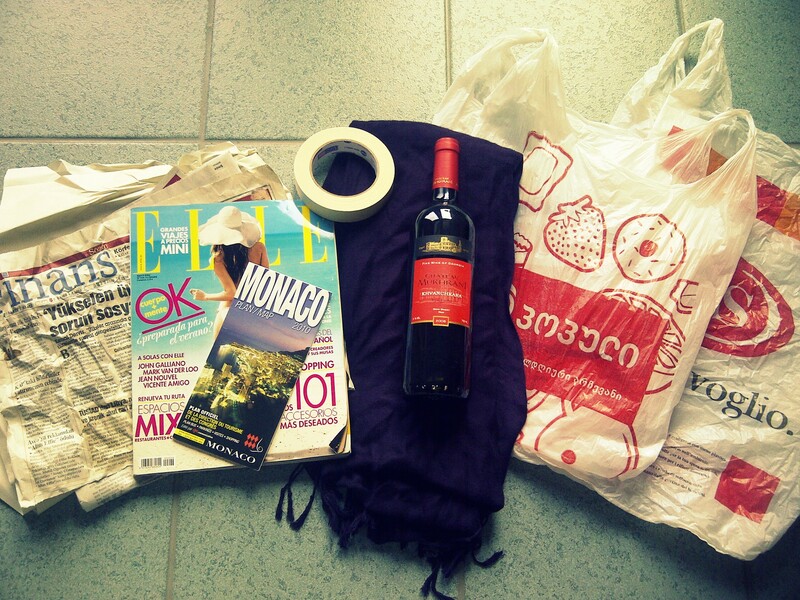 Grocery bags can be used to organize your souvenirs, pack your alcohol bottles (more on that soon!) and carry wet swimsuits, while garbage bags make great ersatz laundry baskets (so you’re not questioning what is clean and what is dirty…). Shampoo broke open in your carry-on quart-size bag? Rinse off all of the toiletries and replace the oozing bag with the fresh one you packed. It’s oh-so TSA-friendly. Zip-lock sandwich bags also work well for storing smaller souvenirs and for stashing away snacks from the hotel’s breakfast buffet for when you’re later dying of jet-lag hunger. 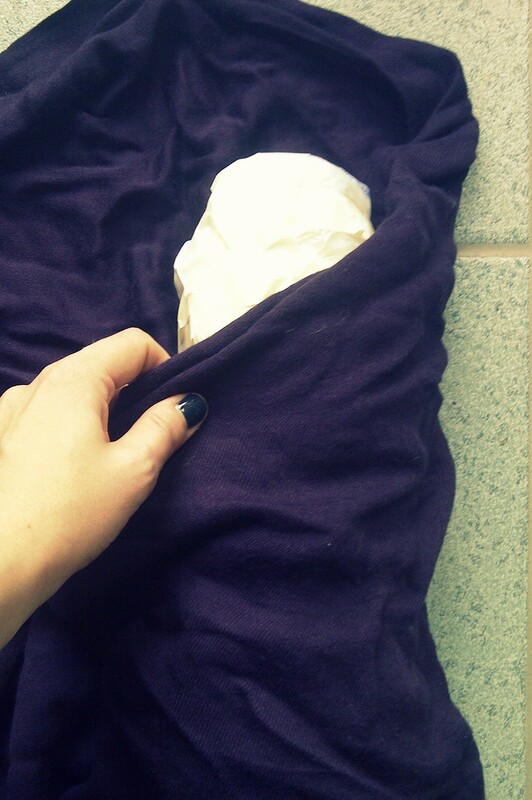 A roll of tape can be a quick fix for a ripped suitcase or broken sandal and a few dryer sheets in your bag can keep your clothes fresh and smelling like home (a remedy for homesickness?). Also, when you need a pair of scissors or a black marker, nothing else will do. Just give in and pack them! 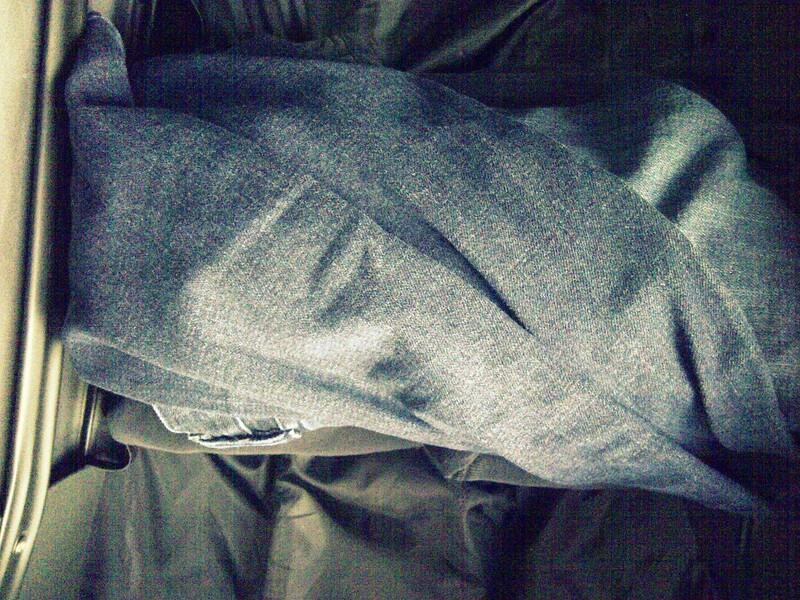 I think one of the most well-used items in my suitcase, however, is the folder. I love keeping restaurant receipts, city maps, and museum tickets as tiny mementos but hate when they get wrinkled or downright destroyed on the journey home! 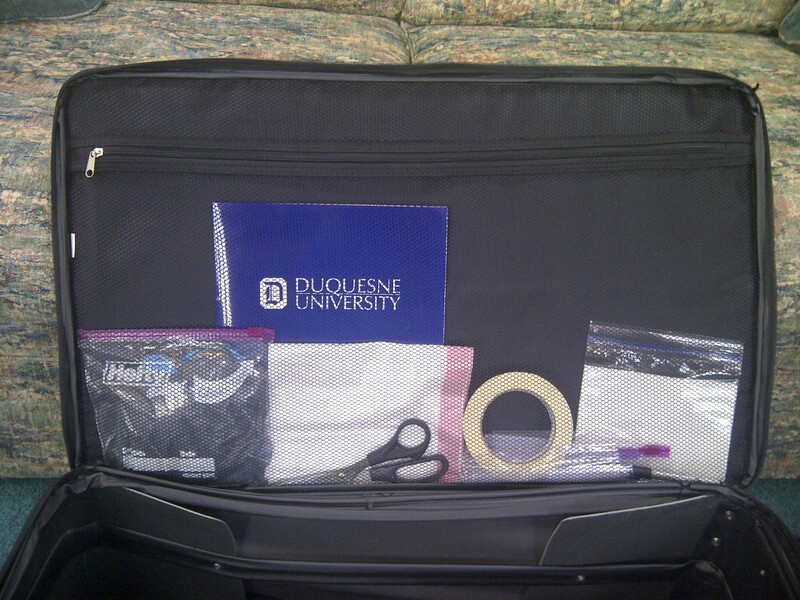 A simple folder (or one with complimentary advertising for Duquesne University) keeps them safe and sound. Folders are also perfect for holding extra copies of flight itineraries, cruise documents, and travel insurance paperwork in addition keeping flat that souvenir photo of you on a camel in Tunisia. Some things need permanently documented. 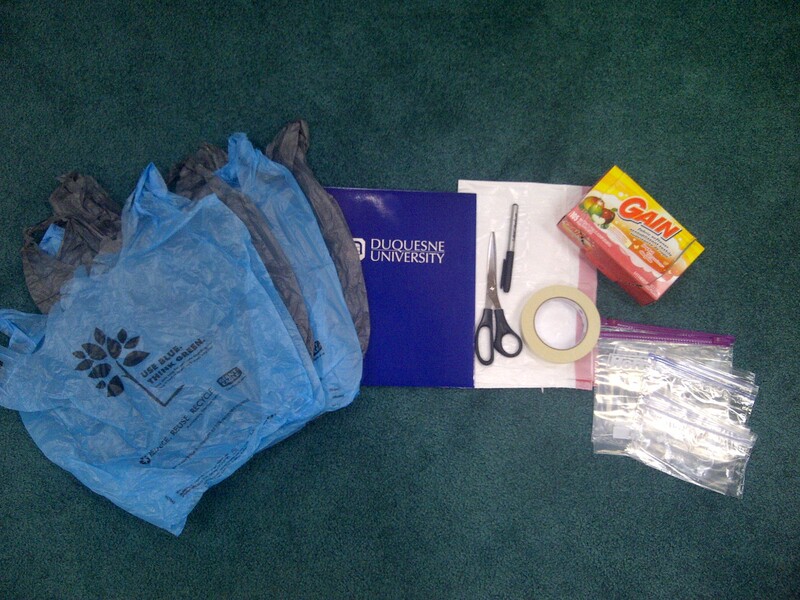 Squeeze the air out of the grocery bags and put them in one of the quart-sized bags for more space. Store everything in the mesh zip pocket of the suitcase’s lid. Done! Mesh lid. Packed. Primed. Lethal.